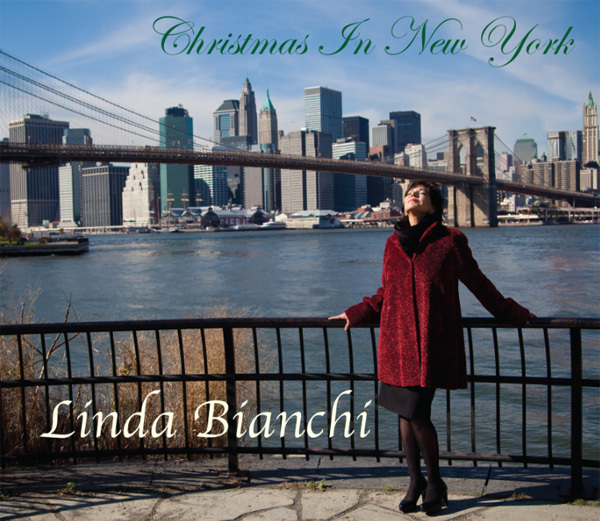 The new CD from Linda Bianchi! The warmth and intimate quality of Ms. Bianchi's voice and interpretation of old favorites is rare and this CD will be treasured. I also loved the innovative combining of Winter Wonderland and When I Marry Mr. Snow. What a pleasure to be able to listen to the purity of the music. I felt as if she was singing just to me. The arrangements and orchestrations were perfect and enhanced the entire experience. Thank you...thank you. This will be a great addition to your holiday playlist whether you are from the Big Apple or not. Linda has made smart choices on this album resulting in a delightful collection. Her voice and the wonderful musicianship combine to capture the joy of the season. 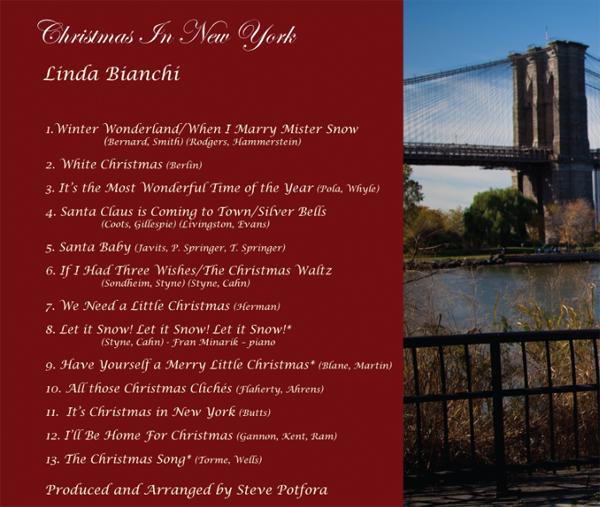 Linda's Christmas in New York CD is the very best thing about Christmas for this reviewer. What a voice! Alternately sassy, saucy and heartfelt, this collection offers some surprising inclusions, and brings a fresh take and tempo to more familiar favorites. Her voice is beautifully controlled throughout. The accompaniments are magical. In an inspired narrative, she brings "Mr. Snow" in from the sea and places him in a "Winter Wonderland." She even makes Parson Brown soar - and that's deserving of the highest accolades! Linda's singing has a wonderful purity and heartfelt quality. The songs on this album are well suited to her style, with a range from wistful ballads to jazzy, sultry tunes. There are some very clever medleys, as well as favorite classics. "Winter Wonderland/ When I Marry Mr. Snow" is a new classic! Linda Bianchi has a way of crafting a song that is at once classic and at the same time totally unique. She brings to mind the great ladies who sang the American songbook, but with a thoroughly modern vibe. Her combination of Winter Wonderland and When I Marry Mr. Snow is one of the albums best! I love it and it will be in my holiday playlist for every Christmas! Absolutely terrific album! Linda has a gorgeous voice, big and beatiful, but most important, alive with vibrant energy. Listening to the album will raise your spirits without even trying. The song choices are terrific. Has a few regular Christmas songs found on most albums, and combines unusual choices, such as When i marry Mr. Snow. Who would have thought to combine that with Winter Wonderland? Linda! And the unusual medley is seamless and beautiful . The musicians on the CD are as fantstic as Linda. Just a delight to listen to, any time of the year. Try it, you'll love it! This is a wonderful album. All of the songs are terrific. Linda has amazing vocals. The arrangements are perfect.